Bryce Dallas Howard is an actress known for roles in the films Spider-Man 3, The Twilight Saga: Eclipse, and Terminator Salvation. Her performance in the TV movie As You Like It earned her a Golden Globe Award nomination. Bryce was born on March 2, 1981, in Los Angeles, California. She is the daughter of writer Cheryl Howard Crew and actor-director Ron Howard. Her ancestry includes German, English, Scottish, and Irish ancestry, with remote French and Dutch roots. 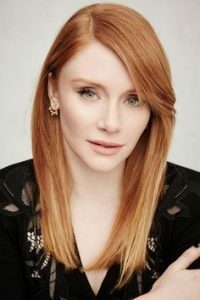 She has been married to Seth Gabel since June 2006. They have two children. She attended and graduated from Greenwich Country Day School. She attended the Tisch School of the Arts at New York University, where she completed her BFA in 2003. *Her ancestry includes German, English, Scottish, and Irish ancestry, with remote French and Dutch roots. *She dyed her hair blonde for Spider-Man 3 in 2007. *She has never use alcohol. *In addition to acting, she likes playing basketball. *She became a vegan for over three years, but after pregnancy, she started eating meat due to her medical condition. *She is close friends with Natalie Portman, Jake Gyllenhaal, Jason Ritter and Marianna Palka.